Home CDN , children , crafts , December , feature , holiday , holidays , homeschool , papercrafts , printables , US , worldwide December 12th - Freebies! -- This holiday is about celebrating the fun of building gingerbread houses, and the fun in eating them too. 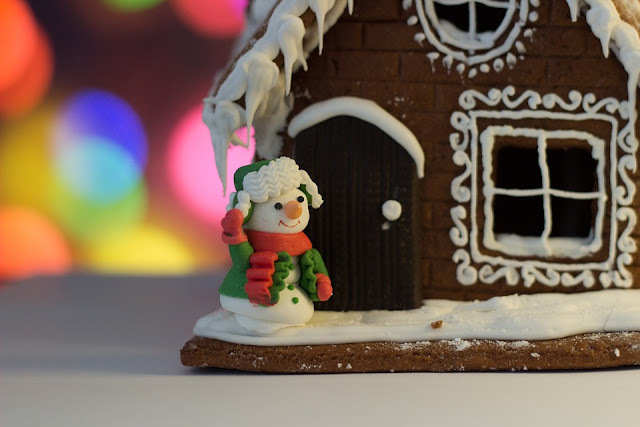 Gingerbread is used to build gingerbread houses similar to the witch's house encountered by Hansel and Gretel. These houses, covered with a variety of candies and icing, are popular Christmas decorations, typically built by children with the help of their parents or guardians. -- Nothing's more enticing for any holiday or special occasion than an awesome, lusciously decorated gingerbread house. With designs for Christmas, Halloween, Valentine's Day, and birthdays, these exquisite projects include a cottage, chalet, and two-story house. Options as customized windows, doors, chimneys, paths, trees, topiaries, and even lighting add to the charm. More than 200 helpful step-by-step process shots; informative sections on tools, techniques, and components; and patterns, piping templates, and tips on baking, assembling, and troubleshooting assures magical results. • Christmas House Cookie Cutter Set -- Even Hansel and Gretel would like this Gingerbread House Cookie Cutter. Why not celebrate the holidays with family by decorating a few houses and giving to your neighbors? Also useful if you're a realtor. Super Cute DIY for All Kinds of Occasions: Christmas, Birthdays Party, Valentine's Day, Thanksgiving, Halloween, Anniversary Day. • Gingerbread House Silicone Mold Kit -- Bring the holiday spirit to everyone. This set makes for a wonderful gift or gift exchange idea. This Silicone mold set will help you easily create your own gingerbread house with your friends and family. Safe for use in the dishwasher, microwave, oven, freezer, and refrigerator. - Have you heard the song - My Ding-A-Ling? You should brace yourself for bizarre and crazy behavior today, from all of the people you encounter today. Even normally conservative people have been known to go a little crazy on this day. Some people say this is a day for wackos, lunatics, and others who are off their rocker. We say it is simply a day to cut loose, act a little weird. - A day to raise the spoon with a dish of Ambrosia salad. Ambrosia is a type of fruit salad normally containing sugars and creams. Some salads can include powdered or granulated sugar and whipped and/or sour cream. The fruits used in this sweet, refreshing dessert are usually oranges, pineapple, grapes, and coconut. - These beautiful flowers are recognized as a symbol of Christmas. Poinsettia Day was pronounced as an Act of Congress. It is in honor of Joel Roberts Poinsett, who died on December 12, 1851. Poinsett was the first Ambassador to Mexico who brought the plant back to his plantation in the U.S. He grew the plants in his Greenville, S.C plantation and gave them out as gifts to friends. - On December 12, 1870, Joseph Hayne Rainey of Georgetown, SC, was sworn in as the first black to serve in the US House of Representatives. Rainey filled the seat of Benjamin Franklin Whittemore, which had been declared vacant by the House. He served until March 3, 1879. - George Franklin Grant was the first person to invent the golf tee in 1899. - The legend of Guadalupe tells how in December 1531, an Indian, Juan Diego, saw the Virgin Mother on a hill near Mexico City, who instructed him to go to the bishop and have him build a shrine to her on the site of the vision. After his request was initially rebuffed, the Virgin Mother appeared to Juan Diego three days later. She instructed him to pick roses growing on a stony and barren hillside nearby and take them to the bishop as proof. Although flowers do not normally bloom in December, Juan Diego found the roses and took them to the bishop. As he opened his mantle to drop the roses on the floor, an image of the Virgin Mary appeared among them. The bishop built the sanctuary as instructed. Our Lady of Guadalupe became the patroness of Mexico City and by 1746 was the patron saint of all New Spain and by 1910 of all Latin America. - Born at Hoboken, NJ, on December 12, 1915, Frank Sinatra matured from a teen idol to the premier singer of American popular music. Known as the Chairman of the Board to his fans, he made more than 200 albums. His signature songs included All the Way, New York, New York and My Way. - To celebrate when the number of the day is the same as the number of the month. Bonza Bottler Day™ is an excuse to have a party at least once a month.